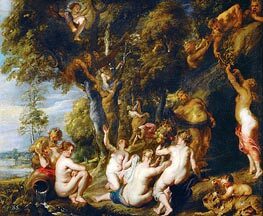 Peter Paul Rubens (June 28, 1577 - May 30, 1640) was a prolific seventeenth-century Flemish Baroque painter, and a proponent of an extravagant Baroque style that emphasized movement, color, and sensuality. He is well-known for his Counter-Reformation altarpieces, portraits, landscapes, and history paintings of mythological and allegorical subjects. Rubens was born in Siegen, Westphalia, to Jan Rubens and Maria Pypelincks. His father, a Calvinist, and mother fled Antwerp for Cologne in 1568, after increased religious turmoil and persecution of Protestants during the rule of the Spanish Netherlands by the Duke of Alba. Jan Rubens became the legal advisor (and lover) to Anna of Saxony, the second wife of William I of Orange, and settled at her court in Siegen in 1570. Following Jan Rubens' imprisonment for the affair, Peter Paul Rubens was born in 1577. The family returned to Cologne the next year. 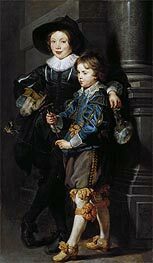 In 1589, two years after his father's death, Rubens moved with his mother to Antwerp, where he was raised as a Catholic. Religion figured prominently in much of his work and Rubens later became one of the leading voices of the Catholic Counter-Reformation style of painting. In 1600, Rubens travelled to Italy. He stopped first in Venice, where he saw paintings by Titian, Veronese and Tintoretto, before settling in Mantua at the court of Duke Vincenzo I of Gonzaga. The coloring and compositions of Veronese and Tintoretto had an immediate effect on Rubens's painting, and his later, mature style was profoundly influenced by Titian. With financial support from the Duke, Rubens travelled to Rome by way of Florence in 1601. There, he studied classical Greek and Roman art and copied works of the Italian masters; the Hellenistic sculpture Laocoon and his Sons was especially influential on him, as was the art of Michelangelo, Raphael and Leonardo da Vinci. 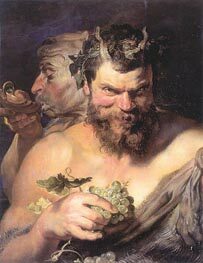 He was also influenced by the recent, highly naturalistic paintings by Caravaggio. 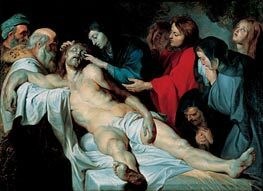 He later made a copy of that artist's Entombment of Christ, recommended that his patron, the Duke of Mantua, purchase The Death of the Virgin, and was instrumental in the acquisition of The Madonna of the Rosary (Kunsthistorisches Museum, Vienna) for the Dominican church in Antwerp. 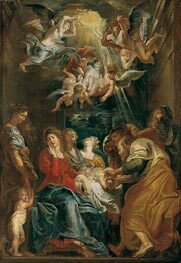 During this first stay in Rome, Rubens completed his first altarpiece commission, St. Helena with the True Cross for the Roman church of Santa Croce in Gerusalemme. Rubens travelled to Spain on a diplomatic mission in 1603, delivering gifts from the Gonzagas to the court of Philip III. While there, he studied the extensive collections of Raphael and Titian that had been collected by Philip II. He also painted an equestrian portrait of the Duke of Lerma during his stay (Prado, Madrid) that demonstrates the influence of works like Titian's Charles V at Muhlberg (1548; Prado, Madrid). This journey marked the first of many during his career that would combine art and diplomacy. He returned to Italy in 1604, where he remained for the next four years, first in Mantua and then in Genoa and Rome. In Genoa, Rubens painted numerous portraits, such as the Marchesa Brigida Spinola-Doria (National Gallery of Art, Washington, D.C.), and the portrait of Maria di Antonio Serra Pallavicini, in a style that would influence later paintings by Anthony van Dyck, Joshua Reynolds and Thomas Gainsborough. He also began a book illustrating the palaces in the city. From 1606 to 1608, he was mostly in Rome. During this period Rubens received, with the assistance of Cardinal Jacopo Serra (the brother of Maria Pallavicini), his most important commission to date for the High Altar of the city's most fashionable new church, Santa Maria in Vallicella also known as the Chiesa Nuova. The subject was to be St. Gregory the Great and important local saints adoring an icon of the Virgin and Child. The first version, a single canvas (now at the Musee des Beaux-Arts, Grenoble), was immediately replaced by a second version on three slate panels that permits the actual miraculous holy image of the "Santa Maria in Vallicella" to be revealed on important feast days by a removable copper cover, also painted by the artist. The impact of Italy on Rubens was great. 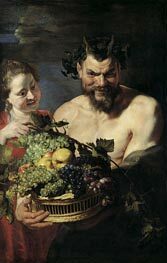 Besides the artistic influences, he continued to write many of his letters and correspondences in Italian for the rest of his life, signed his name as "Pietro Paolo Rubens", and spoke longingly of returning to the peninsula a hope that never materialized. 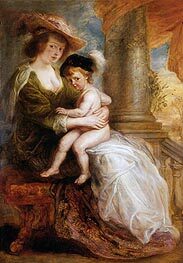 Upon hearing of his mother's illness in 1608, Rubens planned his departure from Italy for Antwerp. However, she died before he made it home. His return coincided with a period of renewed prosperity in the city with the signing of Treaty of Antwerp in April 1609, which initiated the Twelve Years' Truce. 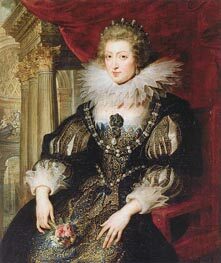 In September of that year Rubens was appointed as court painter by Albert VII, Archduke of Austria and Infanta Isabella Clara Eugenia of Spain, the governors of the Low Countries. He received special permission to base his studio in Antwerp instead of at their court in Brussels, and to also work for other clients. 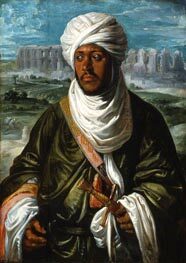 He remained close to the Archduchess Isabella until her death in 1633, and was called upon not only as a painter but also as an ambassador and diplomat. 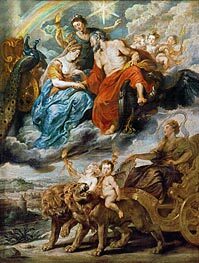 Rubens further cemented his ties to the city when, on October 3, 1609, he married Isabella Brant, the daughter of a leading Antwerp citizen and humanist, Jan Brant. In 1610, Rubens moved into a new house and studio that he designed. Now the Rubenshuis Museum, the Italian-influenced villa in the center of Antwerp accommodated his workshop, where he and his apprentices made most of the paintings, and his personal art collection and library, both among the most extensive in Antwerp. During this time he built up a studio with numerous students and assistants. His most famous pupil was the young Anthony van Dyck, who soon became the leading Flemish portraitist and collaborated frequently with Rubens. He also often collaborated with the many specialists active in the city, including the animal painter Frans Snyders who contributed the eagle to Prometheus Bound, and his good friend the flower-painter Jan Brueghel the Elder. 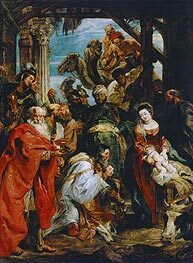 Altarpieces such as The Raising of the Cross (1610) and The Descent from the Cross (1611-1614) for the Cathedral of Our Lady were particularly important in establishing Rubens as Flanders' leading painter shortly after his return. The Raising of the Cross, for example, demonstrates the artist's synthesis of Tintoretto's Crucifixion for the Scuola Grande di San Rocco in Venice, Michelangelo's dynamic figures, and Rubens's own personal style. This painting has been held as a prime example of Baroque religious art. Rubens used the production of prints and book title-pages, especially for his friend Balthasar Moretus, the owner of the large Plantin-Moretus publishing house, to extend his fame throughout Europe during this part of his career. With the exception of a couple of brilliant etchings, he only produced drawings for these himself, leaving the printmaking to specialists, such as Lucas Vorsterman. He recruited a number of engravers trained by Goltzius, who he carefully schooled in the more vigorous style he wanted. He also designed the last significant woodcuts before the 19th century revival in the technique. Rubens established copyright for his prints, most significantly in Holland, where his work was widely copied through prints. In addition he established copyrights for his work in England, France and Spain. After the end of the Twelve Years' Truce in 1621, the Spanish Habsburg rulers entrusted Rubens with a number of diplomatic missions. In 1624 the French ambassador wrote from Brussels: "Rubens is here to take the likeness of the prince of Poland, by order of the infanta" (Prince Wladyslaw IV Vasa arrived in Brussels as the personal guest of the Infanta on September 2, 1624). Between 1627 and 1630, Rubens's diplomatic career was particularly active, and he moved between the courts of Spain and England in an attempt to bring peace between the Spanish Netherlands and the United Provinces. He also made several trips to the northern Netherlands as both an artist and a diplomat. At the courts he sometimes encountered the attitude that courtiers should not use their hands in any art or trade, but he was also received as a gentleman by many. 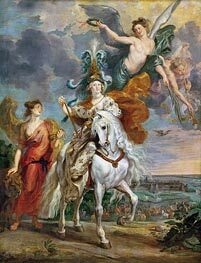 It was during this period that Rubens was twice knighted, first by Philip IV of Spain in 1624, and then by Charles I of England in 1630. He was awarded an honorary Master of Arts degree from Cambridge University in 1629. 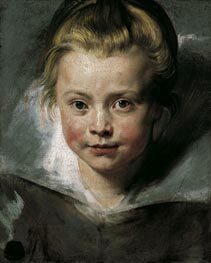 Rubens was in Madrid for eight months in 1628-1629. In addition to diplomatic negotiations, he executed several important works for Philip IV and private patrons. He also began a renewed study of Titian's paintings, copying numerous works including the Madrid Fall of Man (1628-29). During this stay, he befriended the court painter Diego Velazquez and the two planned to travel to Italy together the following year. Rubens, however, returned to Antwerp and Velazquez made the journey without him. His stay in Antwerp was brief, and he soon travelled on to London where he remained until April, 1630. An important work from this period is the Allegory of Peace and War (1629; National Gallery, London). It illustrates the artist's strong concern for peace, and was given to Charles I as a gift. While Rubens's international reputation with collectors and nobility abroad continued to grow during this decade, he and his workshop also continued to paint monumental paintings for local patrons in Antwerp. The Assumption of the Virgin Mary (1625-6) for the Cathedral of Antwerp is one prominent example. In 1630, four years after the death of his first wife, the 53-year-old painter married 16-year-old Helene Fourment. 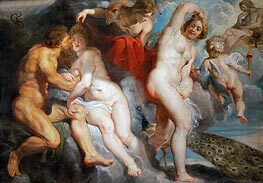 Helene inspired the voluptuous figures in many of his paintings from the 1630s, including The Feast of Venus (Kunsthistorisches Museum, Vienna), The Three Graces (Prado, Madrid) and The Judgment of Paris (Prado, Madrid). In the latter painting, which was made for the Spanish court, the artist's young wife was recognized by viewers in the figure of Venus. In an intimate portrait of her, Helene Fourment in a Fur Wrap, also known as Het Pelsken, Rubens's wife is even partially modelled after classical sculptures of the Venus Pudica, such as the Medici Venus. 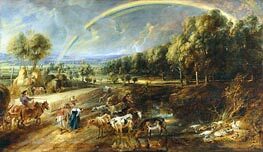 In 1635, Rubens bought an estate outside of Antwerp, the Chateau de Steen (Het Steen), where he spent much of his time. Landscapes, such as his Chateau de Steen with Hunter (National Gallery, London) and Farmers Returning from the Fields (Pitti Gallery, Florence), reflect the more personal nature of many of his later works. He also drew upon the Netherlandish traditions of Pieter Bruegel the Elder for inspiration in later works like Flemish Kermis (c. 1630; Louvre, Paris). 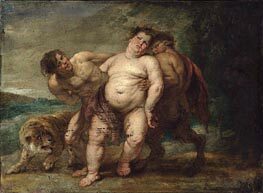 Rubens died from gout on May 30, 1640. He was interred in Saint Jacob's church, Antwerp. The artist had eight children, three with Isabella and five with Helene; his youngest child was born eight months after his death. 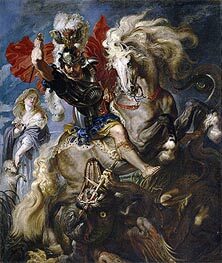 Rubens was a prolific artist. His commissioned works were mostly religious subjects, "history" paintings, which included mythological subjects, and hunt scenes. He painted portraits, especially of friends, and self-portraits, and in later life painted several landscapes. 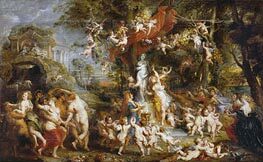 Rubens designed tapestries and prints, as well as his own house. He also oversaw the ephemeral decorations of the Joyous Entry into Antwerp by the Cardinal-Infante Ferdinand in 1635. His drawings are mostly extremely forceful but not detailed; he also made great use of oil sketches as preparatory studies. He was one of the last major artists to make consistent use of wooden panels as a support medium, even for very large works, but he used canvas as well, especially when the work needed to be sent a long distance. For altarpieces he sometimes painted on slate to reduce reflection problems. His fondness of painting full-figured women gave rise to the terms 'Rubensian' or 'Rubenesque' for plus-sized women. The term 'Rubensiaans' is also commonly used in Dutch to denote such women. Paintings can be divided into three categories: those painted by Rubens himself, those which he painted in part (mainly hands and faces), and those he only supervised. He had, as was usual at the time, a large workshop with many apprentices and students, some of whom, such as Anthony Van Dyck, became famous in their own right. He also often sub-contracted elements such as animals or still-life in large compositions to specialists such as Frans Snyders, or other artists such as Jacob Jordaens. 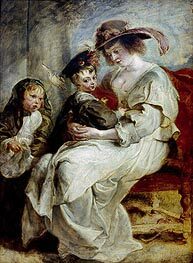 At a Sotheby's auction on July 10, 2002, Rubens' newly discovered painting Massacre of the Innocents sold for £49.5million ($76.2 million) to Lord Thomson. It is a current record for an Old Master painting. 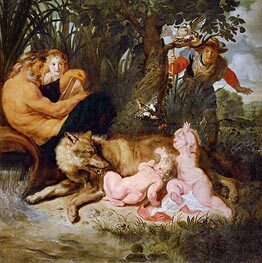 In 2006, however, another lost masterpiece by Rubens, The Calydonian Boar Hunt, dating to 1611 or 1612, was sold to the Getty Collection in Paris for an unknown amount. 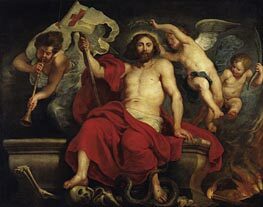 It had been mistakenly attributed to a follower of Rubens for centuries until art experts authenticated it.